WASHINGTON (CNS) — The Catholic Church has been present in the Amazon for centuries, but that presence has not come without errors, said Peruvian Cardinal Pedro Barreto Jimeno. One of those errors is the way it once approached the region’s indigenous communities, he told a news conference during a seminar to discuss how the church and indigenous communities can respond to environmental threats. 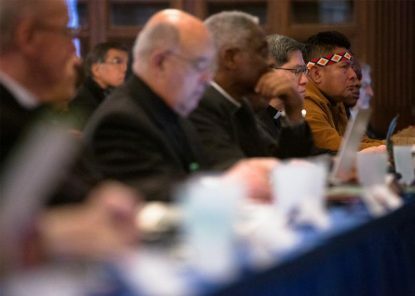 Cardinal Barreto, along with other international church leaders, members of indigenous communities, and environmental organizations related to the Catholic Church and other faith-based institutions gathered in Washington March 19-21 ahead of an October Synod of Bishops on the Amazon at the Vatican. Prelates and others at the synod will consider environmental situations in the Amazon and chart a plan of action. For that meeting to be fruitful, Cardinal Barreto said during a March 20 news conference at Georgetown University, it is important to include the voice and experiences of the region’s indigenous communities. “It is part of a process,” said Cardinal Barreto, archbishop of Huancayo, Peru, and vice president of the Pan-Amazonian Church Network (REPAM for its acronym in Spanish), one of the main players for the Vatican meeting. “We share in the suffering, such as killings of indigenous people, while trying to keep hope alive and that (indigenous communities) will teach us how to live in that integral ecology that the church hopes for,” he said. It is called the “world’s lung” because the abundance of trees in its rainforest help absorb global emissions of carbon dioxide and turn it into oxygen. The Amazon’s deforestation will not just displace indigenous communities who have long called the region home but may also accelerate the warming of the planet, leading to extreme weather patterns everywhere. 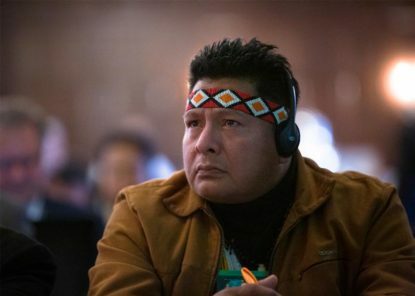 The church, as well as the world, has much to learn about the spiritual, economic and social connections made by indigenous communities and nature, church officials say, and much of it was visible during presentations by members of those communities at the Georgetown gathering. That’s where those like Candido Mezua of Panama’s Embera community shared a vision of nature, the resources it provides for survival, as well as the respect given to it for its benefit for humanity, not just for one community. When you look at situations from that collective and spiritual perspective naturally found in indigenous communities, Mezua said, it becomes easier to go beyond the differences that sometimes make it easier to exploit nature and other human beings. What some of those communities have long practiced is not so different than what the pope has said, except that he put it in writing in his 2015 groundbreaking “Laudato Si'” encyclical, Mezua added. “Regulations alone are not going to solve the (environmental) problem … there has to be a change from a global perspective about the common home … about restoring Mother Earth” to balance, he said. The Vatican synod and its work with indigenous communities can help confront environmental and humanitarian challenges in the Amazon region, said Victoria Tauli-Corpuz, a Filipina and the U.N. special rapporteur for the rights of indigenous peoples, who attended the Georgetown meeting. One of those issues is how to help members of indigenous communities in the Amazon who’ve been threatened or jailed under false pretenses because of their activism to protest the destruction they see around them, said Tauli-Corpuz. At the Georgetown meeting, there was talk about a possible network of legal help Catholic Church institutions, groups and organizations could provide to those facing legal dangers as threats against indigenous environmental activists grow, as well as providing some form of sanctuary. The group Global Witness, which tallies statistics about threats and crimes against environmentalists, said in its latest data available that 201 environmental activists were killed in 2017, with many of those murders occurring in the Amazon. That does not include death threats, arrests, sexual assaults, abductions and other attacks faced by indigenous activists. Those communities, after all, are the best guardians and protectors of a land that provides great environmental benefits for the rest of the world, Tauli-Corpuz said. “I believe that every person who is concerned about life and about the earth should really be working together to protect the Amazon,” she said. The church, because of its global presence and numbers, can also rally an unprecedented defense for the Amazon, said Patricia Gualinga of the indigenous Kichwa community in Ecuador. “This battle that is heading for us, it’s not one that can be undertaken alone,” said Gualinga, referring to the warming of the planet and the consequences that will be unleashed on all of the planet’s inhabitants, not just indigenous communities. Though indigenous communities have long been at the forefront of the fight for the environment in the Amazon, the spotlight the Vatican will shed on it in October can only help the cause, Gualinga said, adding that though success will be measured by the actions proposed and carried out after the synod, great strides already have been made by having church officials engage with indigenous communities in an unprecedented way.